Rainy Saturday mornings are typically an excuse to skip a run, sleep in, and possibly eat comfort foods that help combat the bad weather doldrums. This past Saturday was rainy, but no self indulgence was allowed. Instead, I was up at 5am to road trip with Anne to the Spartan Race / Spartan Sprint just outside Kiln, Mississippi. The drive was easy from New Orleans, and traffic at that ungodly hour minimal. The rain was sporadic, but it didn't keep us from arriving in the middle of nowhere on time. Signage off the interstate was well placed to make sure race participants could find the battle grounds, and everything was really well laid out. From the moment we pulled in to Muddy Joe's RV Park and Camp Ground, Anne and I could tell that it was much more organized than any other mud run / obstacle race we had ever experienced. There were volunteers and staff stationed everywhere instructing runners where to go, what to fill out, how to mark numbers on bodies, etc. The small details that the race organizers paid attention to made all the difference in the world. Even though the rain was still coming down and the grounds were soaked, the excitement was palpable. Anne's wave was set to run at 8:30am, so she headed to line up soon after pinning her bib to her chest. There was an obstacle to climb before she could even get in to the starting corral, and it was at that point she knew this race wasn't playing around. As a spectator, it was so convenient for me to be able to watch and photograph her start, and then walk from point to point on the course to see her participate in select obstacles. Even though her total course was roughly 4 miles, major obstacles were set up in places that allowed spectators the ability to cheer their participant friends on. The Hercules Hoist was the first obstacle I could venture up to, where concrete blocks were attached to ropes and a pulley system, with the requirement of lifting and lowering the block to a certain height. 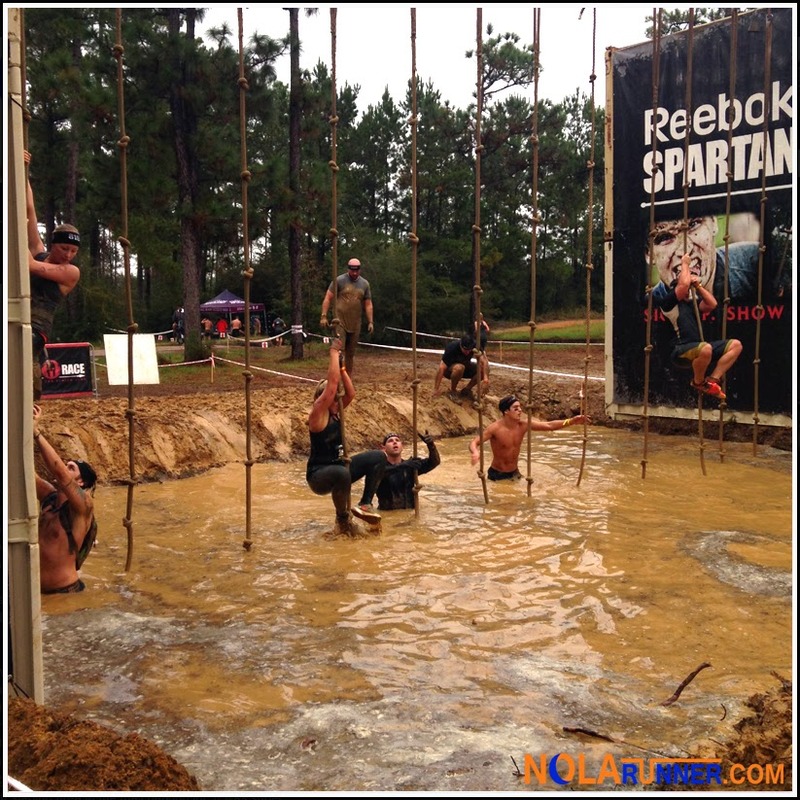 The next obstacle I could see was a crawl through a mud pit covered in barbed wire. Spectators could get really close to this obstacle and take endless amounts of photos. Also in this segment was a rope climb over a three feet deep pool of water. 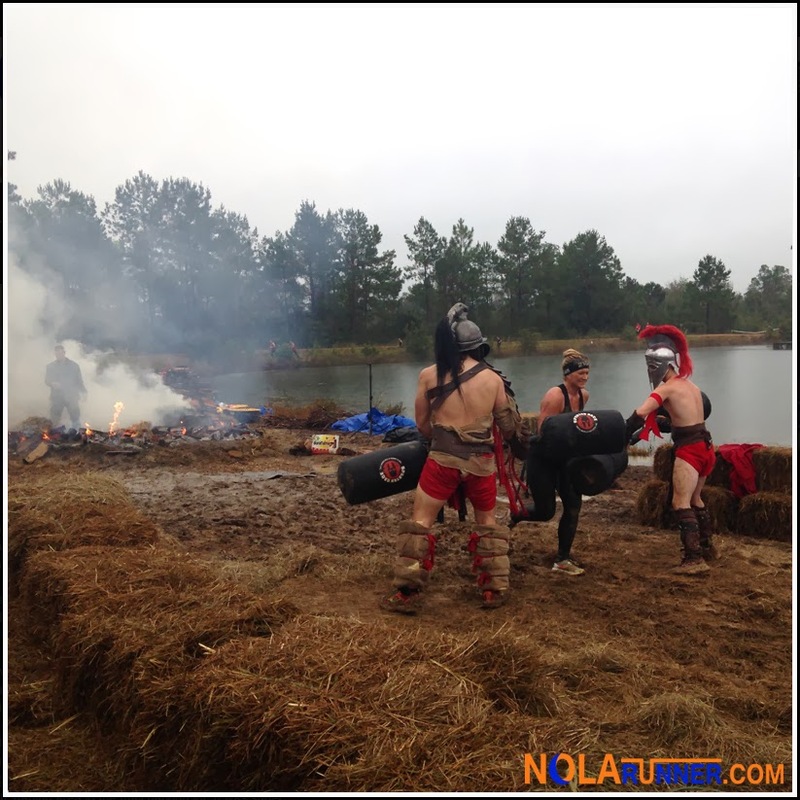 The finish line was another segment of obstacles with a wall climb, fire pit, and finally attacking Spartans. It was this last obstacle I was most concerned about. Not for Anne, but for the Spartans. They were not going to keep her from the finish line. After Anne grabbed her medal, my fun began. We walked over to the "Spartan Power Wash," which were endless hoses attached to a water supply, and I got to spray her down from head to toe with high-pressure water. I was really impressed with the system they had in place for post-race amenities. Definitely a sign of a well run race. Anne's already signed up again for next year, where the race is supposed to be held in the same location around the same date. She also has aspirations to participate in longer versions of the race in other cities. A Spartan Race in London sounds like a crowd support mission I could get behind! 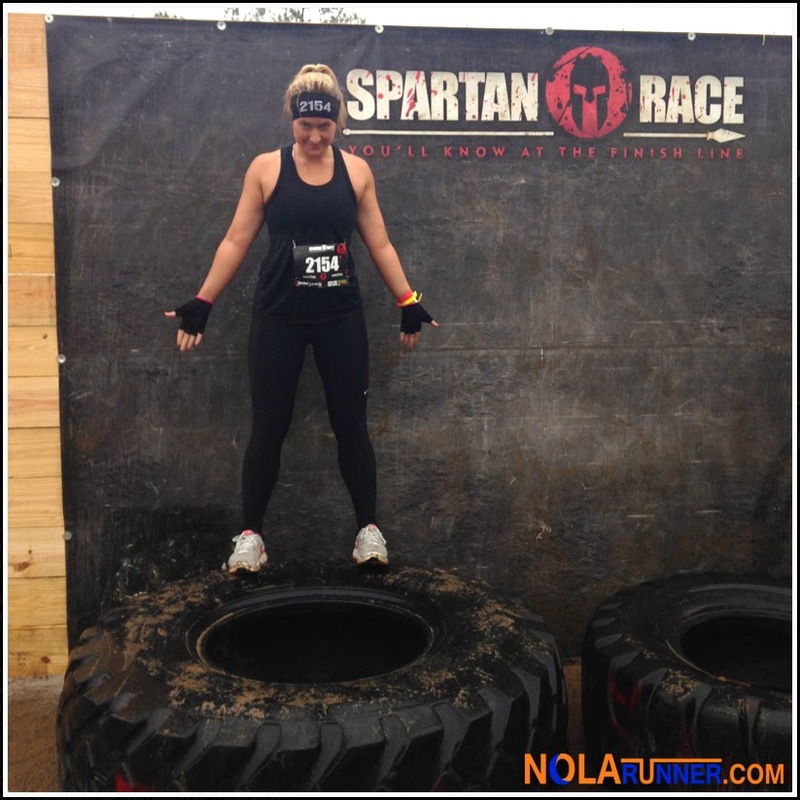 Check out more photos from the race by LIKING the NOLArunner Facebook page HERE.